Following the 9/11 terrorist attacks, most nations have passed new counterterrorist legislation. One of the common assumptions about such legislation is that it is almost always detrimental to individual human rights and civil freedoms. The majority of past studies, which examined a diverse set of countries, has suggested that this is indeed the case and that counterterrorist legislation almost always results in subsequent repression. In this chapter, I reassess these assumptions in a more systematic fashion, analyzing large-scale cross-national data. The analyses presented here rely on a comprehensive database of nation-level counterterrorist legislation and update my work reported in 2016 in Social Science Research and in Studies in Conflict and Terrorism in 2018. These analyses show that the effects of legislation vary by levels of initial repression. Legislation has a negative effect on respect for civil liberties in countries with moderate levels of repression. However, this effect diminishes or disappears in traditionally non-repressive countries and reverses in countries with high levels of repression. In the aftermath of the terrorist attacks of September 11, 2001, scholars have been increasingly engaged in debates over the tension between states’ counterterrorist measures and their respect for human rights and civil liberty principles (Shor 2010). This debate has its roots already in the classic writings of thinkers such as Thomas Hobbes and Niccolo Machiavelli, who argued that individuals must be willing to surrender certain powers and rights so that states can provide them with better personal security. During the second half of the twentieth century, with the ascendance of modern terrorism in liberal democracies (mainly in Europe), sociologists and political scientists have begun writing on the trade-off between counterterrorist policies and individual rights (Charters 1994; Crenshaw 1983, 2001; Hewitt 1984; Wilkinson 2001). The aftermath of 9/11 brought with it an influx of new writings, largely focusing on the global war on terrorism and its perceived endangerment of what some human rights scholars have named “the international human rights regime” (Donnelly 1989, 1999). 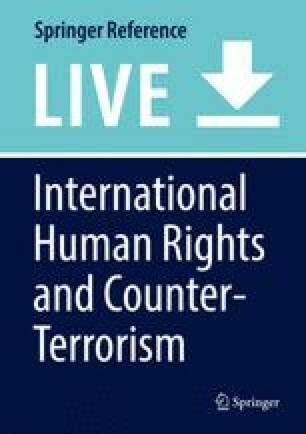 In this chapter I examine the common belief that counterterrorist legislation is associated with greater violation of core human rights and civil liberties. This claim appears to receive support from a wide range of empirical case studies, conducted in various geopolitical locales. The large majority of these studies conclude that counterterrorist legislation indeed leads to the subsequent repression of both rights and liberties. However, these analyses often suffer from a narrow historical focus, preventing careful comparisons between states’ practices before and after the adoption of these laws. In addition, most of these case studies lack a broader cross-national comparative angle. The analyses presented here utilized the exhaustive database on nation-level counterterrorist legislation, presented in the first section of this edited volume. These data are explored in conjunction with cross-national data from various sources on states’ respect for human rights and civil liberties, as well as on other prominent cross-national variables. The chapter explores the frequent decoupling between states’ official statements and commitments (including the adoption of legislation that often includes potentially repressive elements) and their actual practices of repression. The 9/11 attacks sparked a wide wave of counterterrorist legislation. Most countries passed new counterterrorist measures during the first decade of the new millennium. Some of this legislation was the results of pressures from the United States and the United Nations Security Council, which only 3 weeks after the attacks passed Resolution 1373, calling on all countries to adopt measures for fighting terrorist threats. This new wave of legislation brought with it considerable media, public, and academic controversy, with many wondering about the necessity of these new laws and their possible deleterious effects. Much of the critique directed toward counterterrorist legislation in recent years has focused on its presumed harmful effects for core human rights and civil liberties (Cassel 2004; Chang 2002; Etzioni 2004; Falk 2007; Forsythe 2007; Galli 2013; Golder and Williams 2006; Scheppele 2004a). Empirical case studies, most of them looking at post-9/11 legislation in Western nations, have suggested that counterterrorist legislation is associated with state repression. These studies have often reported that legislation has reduced countries’ respect for both core human rights (Clarke 2010; Elliott 2009; Falk 2007; Fenwick 2002, 2005; Fenwick and Phillipson 2005; Forsythe 2007; Golder and Williams 2006; Haubrich 2003; Head 2002; Kalhan et al. 2006; Keck and Sikkink 1998; Kumar 2005; Oehmichen 2009; Scheppele 2004b; Shafir 2007; Sikkink 2004; Sikkink and Walling 2006; Whitaker 2007) and important civil liberties (Adelman 2007; Cassel 2004; Chomsky 1991, 2011; Clarke 2010; Donkin and Bronitt 2013; Elliott 2009; Etzioni 2004; Falk 2007; Fenwick and Phillipson 2005; Fenwick 2005; Forsythe 2007; Galli 2013; Golder and Williams 2006; Haubrich 2003; Head 2002; Kalhan et al. 2006; Kumar 2005; Oehmichen 2009; Scheppele 2004a, b; Whitaker 2007; Zhou 2015). While the majority of this empirical research views legislation as harmful to states’ respect for individual rights and liberties, a few case studies have suggested that legislation and repression may in fact be unrelated. Epifanio (2011), for example, claimed that while legislation has been harmful for civil liberties in the United States and the United Kingdom, other countries, such as Canada, Switzerland, and the Scandinavians, were able to pass laws without curtailing liberties. Alonso and Reinares (2005) offered a similar argument for the case of Spain. Whitaker (2007) noted that more repressive states, such as Russia, Egypt, Malaysia, or Syria, hardly need formal legislation to take advantage of regional or global climates (such as the “war on terror” in the new millennium) that support or allow the abuse of civil liberties. Indeed, security does not necessarily stand in opposition to human rights and civil liberties, and it can be achieved without compromising these rights and liberties (Biggio 2002; Golder and Williams 2006; Shor 2010). The delicate balance between public security and individual rights and liberties has been at the center of academic, media, and public debates in the post-9/11 era. Politicians, journalists, and some scholars have suggested that various rights and liberties should be compromised as a necessary “lesser evil” in the fight against terrorism (Dershowitz 2002; Duner 2008; Minow 2005). Michael Ignatieff (2002, 2004), one of the leading advocates for this approach, suggested that in times of emergency, countries should be allowed to adopt democratically authorized abridgements of the rights of some to preserve the safety and liberties of all. He argued that while countries should never compromise core rights, such as the right to be free from torture, the curtailment of other rights and liberties, such as the freedom of assembly, some privacy rights, and the right for free speech, may be justified, perhaps even necessary, when societies face an existential security threat. Considering these common inclinations, it seems quite possible that legislation may indeed contribute to greater subsequent infringements. While such a relationship between legislation and repression is certainly plausible, it is by no means obvious. Neo-institutional and world polity theories in sociology, as well as constructivist theories of international relations, suggest a frequent decoupling between states’ declarations and their actions on the ground. Governments, in particular when confronted with uncertainty, often adopt policies and laws from other countries as a form of window dressing and compliance with the demands of the international community. These laws remain no more than declarative statements with very few consequences to state practices. In support of this approach, recent research demonstrates that countries often adopt counterterrorist legislation following the example of neighboring countries (Pokalova 2014). They do it even when actual levels of terrorist threats appear to be low (Shor 2017) and despite the fact that much of this legislation fails in reducing future terrorist attacks and casualties (Shor 2016). Further complicating the story, recent reviews of political repression have highlighted the importance of disaggregating repressive practices in various locales (Davenport 2007; Earl 2011). From a theoretical standpoint, it is indeed important to recognize that counterterrorist legislation may operate differently in countries that are habitually more prone to violate human rights and civil liberties and in those that are less inclined to use repression regularly. Specifically, following the insights of former case studies (Alonso and Reinares 2005; Epifanio 2011), legislation may have no effect on repressive practices in liberal democracies with traditionally high respect for these rights and liberties, such as the Netherlands or Sweden. Political, legal, and security institutions in these countries are well accustomed to these rights and liberties and may share greater respect for them, preventing these institutions from exercising repressive policies even when given the opportunity. The governments of these countries are also less likely to suffer from an opposition that threatens to destabilize the regime through the use of violence. Therefore, heavily repressing oppositional elements may in fact prove counterproductive for political survival. While new counterterrorist legislation is not expected to substantially increase repression in most liberal democracies, this may not be the case for countries with a worse record of respect for these principles. In those countries with a medium to high level of repression to begin with, it seems more likely that counterterrorist legislation would serve as a catalyst for further repression. First, these countries, which are usually less democratic, are more likely to suffer from higher levels of internal instability and violent threats to the survival of the regime. They may therefore use new legislation as a means to “discipline” oppositional forces or minority groups that are deemed to pose a threat to the regime. In the process, they will also be more likely to adopt measures such as limitations on the freedoms of movement, assembly, and religion, as well as more severe measures, such as targeted assassinations and torture. Second, moderate and high-level repressive countries are also less likely to have in place institutional checks and balances that may prevent governmental abuse of new legislation. Consequently, states may use even seemingly harmless legislation for pursuing practices that infringe on individual rights and group liberties. Finally, in countries that are habitually more repressive, the ideologies and principles of human rights and individual liberties are likely to be less entrenched in institutional and cultural traditions. As a result, governments may be more willing and more able to further deviate from these principles when facing real or imagined security threats, with no substantial push back. Local rights advocacy groups may not be well established and powerful enough to efficiently resist the changing practices, and local publics may not recognize or be sufficiently concerned about further erosion of human rights and civil liberties, as they lack a tradition of paying close attention to these practices. Data for the dependent variables – state repression of physical integrity rights and civil liberties – come from two distinct sources. First, I obtained data on states’ respect for both physical integrity rights and civil liberties for the years 1981–2013 from the Cingranelli-Richards (CIRI) dataset (Cingranelli and Richards 2010). CIRI information relies both on the annual US Department of State’s country reports on human rights practices and on Amnesty International’s annual reports. CIRI has the advantages of being updated annually and containing data on specific (rather than just aggregated) state practices. I present analyses for a combined 9-point scale of four physical integrity rights (extrajudicial killings, disappearances, torture, and political imprisonment) and a combined 15-point scale of seven individual freedoms (speech, assembly, religion, domestic movement, foreign travel, worker rights, and electoral self-determination). In the interest of easier interpretation, for both scales, I reversed the original CIRI measures, so that higher scores represent more repression of freedoms. For further details on the physical integrity rights measurements and descriptive statistics of the independent variables appearing in these analyses, see Shor et al. (2016). Second, I obtained complimentary data on states’ respect for civil liberties from the Civil Liberties Dataset (CLD), which presents some unique advantages over the CIRI measurement of civil liberties (Skaaning 2015). While the two datasets are somewhat correlated, the correlation is not very high, indicating that they capture different aspects of the empirical variation in civil liberties (Skaaning and Moller 2012). The CLD uses US State Department Country Reports on Human Rights Practices and is available for the years 1976–2010. It takes into account the actual practices of states and their agents, rather than formal legal guarantees, a feature which is especially important in separating the dependent and independent variables in the current analysis. I computed a combined 13-point CLD scale, based on the four major freedoms reported: expression, assembly and association, religion, and movement and residence (each ranked on a four-point scale). As with CIRI, I reversed the original scale in order to make the interpretation of the results more intuitive, so that in the analysis presented here, a higher rank means more repression. The list of control variables in the analyses reported here is identical to the list reported in previous publications on which this chapter is based (Shor et al. 2016, 2018). These publications also include more details on each of these variables, their measurement, and their data sources. This list relies on previous research efforts in this field, controlling for variables that were consistently shown to matter in predicting countries’ levels of human rights and civil liberties repression (Dreher et al. 2010, 2012; Piazza and Walsh 2009; Poe and Tate 1994; Poe et al. 1999; Shor 2008a, b). First, and most important in the context of the present analysis, I controlled for the presence of terrorism itself (logged number of terrorist events in a given country-year), constructed from the widely used Global Terrorism Database (GTD) (START National Consortium for the Study of Terrorism and Responses to Terrorism 2013). I also included in all models a measure of the number of terror attacks in neighbor states, attempting to capture the level of terrorist threats. Other controls include variables related to internal pressures, violence, and instability: internal dissent (strikes, riots, revolutions, and demonstrations), regime instability, civil war, and international conflicts. I also controlled for factors related to processes of globalization and cross border diffusion, including globalization (Dreher 2006; Dreher et al. 2012), the average level of physical integrity rights or civil liberties repression in neighboring countries, democracy, population size, and GDP per capita. Full results for these control variables appear in the previous analyses, while here I chose to focus on the relationship between legislation and repression. The analyses cover all countries for which data were available between the years 1976 and 2011. Similar to previous research in this field, the unit of analysis is country-year, with all independent variables lagged 1 year. (In order to capture the longer-term effects of various predictors and policies, we also ran statistical models in which the independent variables were lagged 2–7 years. We do not present these models in the current paper, as they have poorer fit to the data. Further, results did not change substantially, suggesting that the findings are robust to the specification of time-varying influencing factors.) The results shown below all come from generalized partial proportional odds models (Williams 2006). These models are both theoretically justified, in order to capture the variations in initial levels of repression, and are more accurate from a methodological perspective, as omodel tests of the proportional odds assumption showed that the data failed to satisfy this assumption (p > 0.05). In Fig. 1, I present results for the effects of counterterrorist legislation on the aggregated index of states’ repression of physical integrity rights (extrajudicial killings, disappearances, torture, and political imprisonment) by level of initial repression. This figure and Figs. 2 and 3 present odds ratios derived from a partial proportional odds regression panel analysis. They thus all show results by initial level of state repression. Odds ratios above one are associated with an increased probability that a country will have higher levels of state repression in the year following legislation, while odds ratios below one mean that counterterrorist legislation is associated with lower levels of repression in subsequent years. The figure shows the odds of moving between any two adjacent levels of repression in the physical integrity rights scale. The results demonstrate that counterterrorist legislation does affect the repression of physical integrity rights, but only among countries with intermediate repression scores. That is, legislation does not have a statistically significant effect in countries that occupy the extreme ends of the distribution (i.e., moving from levels 0 to 1, 1 to 2, 6 to 7, and 7 to 8). However, it has a statistically significant association with increased repression in the intermediate levels (i.e., moving from 2 to 3, 3 to 4, 4 to 5, and 5 to 6; significant at either the 0.05 or 0.1 levels). These results mean that in countries that hardly violate physical rights (such as Canada, Germany, Japan, or Sweden) and in those that violate them excessively (such as China, Colombia, Iran, or Liberia), legislation has no significant effect over repression. However, in countries that mostly occupy the intermediate levels of repression (such as Israel, Brazil, Turkey, or Mexico), counterterrorist legislation is associated with higher consequent repression of physical integrity rights. In Figs. 2 and 3, I present results for the effects of counterterrorist legislation on the two aggregate measures of state repression of civil liberties. Similarly to Fig. 1, in both figures the analyses are from partial proportional odds regression models, thus showing the effects by levels of initial state repression. In Fig. 2, the composite measure of civil liberties repression is from CIRI, while Fig. 3 shows results for the composite civil liberties measure from the CLD. Similar to Fig. 1, coefficients for each model reflect the effects of counterterrorist legislation on the odds of moving between any two adjacent levels of repression. For example, the coefficient in Model 2 of Fig. 3 means that adopting legislation in the previous year increases by about 58% the odds of moving from a repression score of 2 to a more repressive score of 3. The results in Figs. 2 and 3 once again demonstrate that counterterrorist legislation influences the repression of civil liberties, but only among countries with intermediate and low-intermediate repression scores. For the CIRI index of civil liberties (Fig. 2), legislation has a statistically positive (i.e., harmful) effect on moving from a lower level to a higher one for the fourth and the fifth score, while the effect for countries which typically have either lower or higher scores is not significant. For the CLD measure (Fig. 3), legislation has a statistically positive (i.e., harmful) effect on moving from one level to the next between the second and the seventh scores, while the effect for countries which typically have the two lowest scores is not significant. Interestingly, the direction of coefficients reverses when approaching the high end of the continuum (although results are mostly nonsignificant due to a small sample size), suggesting that legislation might have a somewhat beneficial effect in these locales, as it is associated with less repression for countries that typically use severe repressive practices. These results mean that in countries that hardly violate civil liberties (most Western- and Northern-European countries, as well as other liberal democracies like the United States, Canada, Australia, New Zealand, Japan, Argentina, and Uruguay), legislation has had no significant effect. However, in countries that mostly occupy the intermediate levels of repression scores, counterterrorist legislation is associated with higher consequent repression of physical integrity rights. It should be noted that this category, in fact, comprises the majority of the countries in the world. It includes most of the countries in South and Central America, as well as most Eastern European countries and many of the African and Asian nations, but also some OECD countries, such as the United Kingdom, Greece, and Israel. Finally, nations that typically occupy the highest levels of repression scores include most of the countries in Central Asia (e.g., Iran, Afghanistan, and Pakistan), the Middle East, North Africa, and East Africa, as well as countries like Russia, China, Malaysia, and Cuba. In these countries, legislation may actually prove beneficial, as it is associated with a decrease in the risk of applying greater repression of civil liberties. This chapter examined the association between counterterrorist legislation and the repression of physical integrity rights and civil liberties. I found an intricate relationship between these variables, varying by levels of initial state repression. While a large body of case studies has previously reported a harmful effect for legislation on both human rights and civil liberties (e.g., Almqvist 2008; Chang 2002; Clarke 2010; Golder and Williams 2006; Haubrich 2003; Head 2002; Kalhan et al. 2006; Sentas 2014; Whitaker 2007), the results presented here demonstrate that this phenomenon appears to be particularly relevant in countries that previously exhibited moderate levels of repression. These include countries like the United Kingdom, Greece, Israel, and Turkey, as well as most of the countries in East and Southeast Asia, South and Central America, and Eastern Europe. In these countries, legislation is indeed likely to be associated with subsequent practices that infringe on both human rights and civil liberties. However, this association diminished and even disappeared in non-repressive countries, such as Canada, Germany, Japan, and Sweden. Moreover, in countries that regularly exhibit high levels of repression (e.g., China, Iran, or Liberia), legislation actually had the reverse effect, reducing the odds for subsequent repressive practices. That is, severe repressors were actually less likely to further exacerbate their repressive practices following the passage of counterterrorist legislation. These contrasting tendencies clarify that the relationship between security demands on the one hand and respect for human rights and civil liberties on the other hand is not straightforward and there is no zero-sum game between the two. Instead, this chapter highlights the need to recognize the diverse ways in which legislation has been operating and pay closer attention to the settings in which it is drafted, enacted, and utilized. One interpretation for such results is that those countries with moderate levels of repression are often also more likely to suffer from high levels of terrorist threats and acts. Therefore, at least some of their legislation is adopted in an actual attempt to fight terrorism (coupled with a trade-off for personal rights), rather than a declarative practice. Another way to interpret the differential results by baseline level of repression is to examine the countries in the two extremes. On the lower end of the spectrum, we find countries such as Canada, Germany, Japan, and Sweden. These countries tend to have great respect for physical integrity rights and civil liberties and are generally careful not to hurt these rights, which are often deeply entrenched in their constitutions and education systems, following decades or even centuries of subscribing to liberal ideals. Such ideals are mostly coupled with lower levels of terrorist threats and other serious threats of political violence, as well as with greater attention to humanitarian pressures from the international community and a vibrant local network of human rights activists, who carefully monitor governmental violations. Legislation in these countries is thus likely to be careful and measured and is unlikely to lead to more repressive practices. On the other end of the spectrum, countries that habitually repress various rights and liberties (most Middle-Eastern and Northern- and Eastern-African countries, as well as countries like Russia, China, Cuba, and Indonesia) may already be using as much repression as they deem necessary. For them, counterterrorist legislation may truly be redundant, and when it is adopted, the reason is often purely declarative. These countries have no real need for such legislation, neither for fighting security threats nor for exercising control over their population and crushing the opposition. This is because they likely already achieve both of these goals with their current ongoing repressive measures. In contrast, countries with intermediate repression scores are clearly most susceptible to the potential harmful effects of legislation. Unlike highly repressive states, they have substantial room for further aggravation of repressive policies. When compared with states with low levels of repression, they often suffer from more serious security threats, while their level of commitment to human rights principles and the ability of local and international human rights networks to monitor repressive acts are less well established. One of the more interesting findings presented in this chapter is that in many cases legislation is not associated with the violation of human rights and civil liberties. This finding is in line with theoretical thinking that highlights the declarative nature of many organizational practices. Neo-institutionalist scholars have long been studying the frequent disconnect between states’ declared policies, regulations, and laws and the actual results of such declarative acts (Frank et al. 2000; Meyer et al. 1997; Schofer and Meyer 2005; Shor and Yonay 2010, 2011). Indeed, countries often adopt counterterrorist legislation regardless of actual terrorist threats, mainly because other countries have previously adopted similar laws (Shor 2017). Thus, it appears that governments interested in crushing local opposition or violating individuals’ rights for other purposes (e.g., to instill fear or increase state control) often do not see the need for legislation. Instead, they may use the current laws or rely on extra-legal actors and measures. In fact, avoiding new explicit legislation may prove to be a preferable strategy for many states. When adopting such legislation, governments often invite fierce parliamentary and media debates that draw attention to the questionable aspects of the legislation and expose them to domestic and international criticism. This appears to have been the case for many North American and European countries following the 9/11 attacks (Donohue 2008; Haubrich 2003) but also for other nations. Whitaker (2007) brings the examples of South Africa, Indonesia, South Korea, and the Philippines, where passing counterterrorist laws has provoked fierce parliamentary debates and widespread critiques from domestic opposition. Others note the ferocious debates and critiques over the 2002 Prevention of Terrorism Act (POTA) in India, which eventually led the Indian government to repeal the law in 2004 (Kalhan et al. 2006; Kumar 2005). The examples above demonstrate the potential for a legislation backlash, or what Keck and Sikkink (1998) call a boomerang effect, where states that resist local and international pressures to comply with human rights and civil liberty norms risk greater future pressures. Declarative legislation, including clear policies that potentially endanger respect for core human rights, may produce pressures by local opposition and human rights advocates, as well as by transnational monitoring bodies, NGOs, and powerful liberal democracies. In other words, in the wake of seemingly repressive legislation, governments may come under the watchful eye of both domestic and international actors. These form powerful transnational alliances that monitor the government’s activities and demand special care in protecting human rights. While governments may not be willing to abort the legislation itself, they would consequently feel the need to be especially careful and refrain from adopting overt repressive policies. The current study thus joins a long line of research that questions the relationship between what governments say and declare (in the form of formal statements or, in this case, adopted legislation) and their actual practices. In the field of human rights research, studies have shown a frequent disconnect between such statements and actions on the ground (Risse et al. 1999; Shor 2008a; Yonay and Shor 2014). Hafner-Burton and Tsutsui (2005), for example, demonstrated that governments’ ratification of human rights treaties often serves merely as window dressing, decoupled from human rights practices and at times even leading to the exacerbation of repressive policies (at least in the initial period after adoption). The current study suggests that such decoupling may also occur in the opposite direction: the adoption of ostensibly repressive legislation is often decoupled from repression on the ground. Finally, while instructive, the findings presented in this chapter should also be viewed with some caution. One possible limitation may be the restricted nature of the dependent variables. While the two databases from which these variables were extracted (CIRI and CLD) cover an essential spectrum of key human rights and civil liberties, they do not provide information on the violation of other liberties that may be of importance in the current context. For example, Almqvist (2008) argues that financial legislation mainly hurts the right for individual possession of property and for due trial and criminal procedures. However, the CIRI and CLD do not provide direct measures of these two rights, and therefore one cannot rule out the option that these are affected by legislation even in the least repressive countries. Similarly, legislation may affect other civil liberties that are not measured by the CIRI or CLD. In particular, some individual freedoms such as privacy rights or the freedom from extortion and abuse may be of interest in future studies, provided that one attains access to reliable cross-national measures of these rights and freedoms.